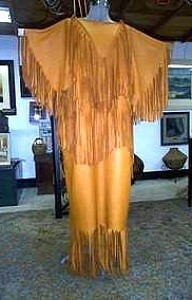 All pictures are representative of actual item you might receive. 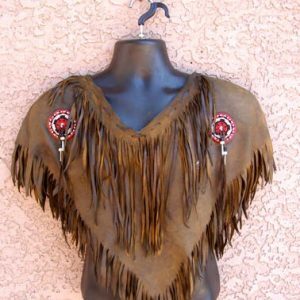 The pictures seen here are of past works, but this item can be recreated in your size & to your specifications. 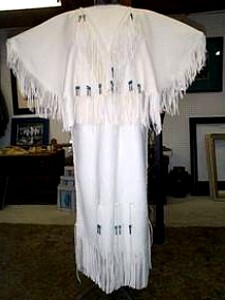 Additional decorations such as bead work, belts, matching moccasins, etc… are available upon request for additional fees. 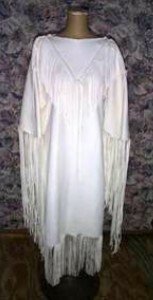 This dress is offered as a full length, white buckskin dress with 3/4 sleeves & long flowing fringe. After your purchase, please have your measurements in inches handy. We will call you for fitting information. Please be sure to include your valid telephone number during the checkout process. Waist size – bust size – hip size – distance from nape of neck to bend of knee – distance from wrist across nape of neck to opposing wrist – distance from shoulder to shoulder. 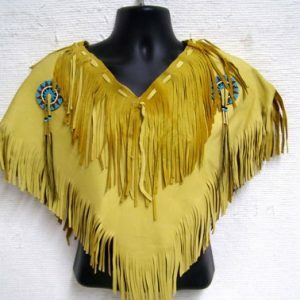 We will also ask if you want the leather suede side facing inward or outward.